You may seen all the LED lights has the IP rating data. Do you know what is IP rating. Today AIS LED will share will you some tips about IP rating with LED lights. When water meets electricity, something will happen. Of course,it is not a pretty sight together. In fact, water and electricity can be a cause of deadly electric shocks together. Sometimes it will be life threatening. For LED lights, water can ruin the light quickly or over time. Waterproof LED lighting is the solution to tackle the electric shock risk as well as extending the life of lighting fixture. For example, you may offen seen some waterproof LED lights with IP rating IP65 such as the LED street light, LED flood lights. According to different IP rating,waterproof levels can vary dramatically. Full Waterproof LED lights are different from water resistant lights. And water resistant LED lights are different from regular lights. Waterproof LED lights are designed to make sure that they can sustain with any amount of water. However, water resistant lights can only work well for an infrequent and certain exposure to water. As we know,LED lights offer numerous benefits such as energy saving. They conserve electricity and enhanced savings, along with durability. Another benefit they can give you in working well despite being exposed to different solid and liquid particles. For indoor and outdoor LED lights, they come with different Ingress Protection (IP) ratings. 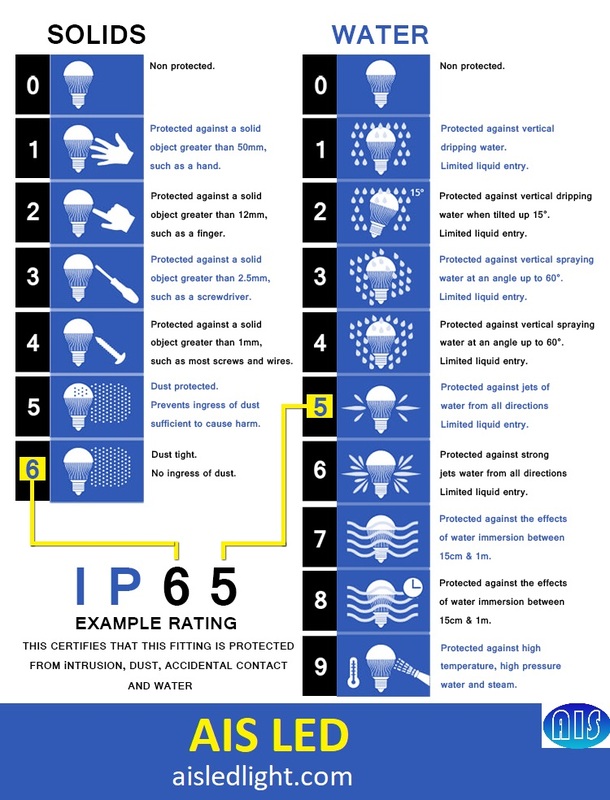 An IP rating of LED light is the measurement of protection that LED light will have against liquid (water) and solid (dirt, dust etc.) objects. There are two numbers in the IP rating,The first number (0 to 6), in an solid IP rating. It shows the resistance against solid objects. The second number (0 to 8) implies the protection against water. Now Let’s have a look at different IP ratings to get an idea of how they work. And different IP rating offer different protection against solids and liquids. LED lights with IP67 ratings give complete protection against solid and water. They are similar to IP65 and and IP64. The protection against liquids is same. However,LED lights with this rating are much more resistant to water as compared IP65. Water will have no effect on LED light even if it is immersed in water of the depth of 1m. The most common waterproof LED lights are IP65 LED lights. They provides maximum protection against solid particles and a good amount of resistance against liquid particles as well. They can be fit to use for both in domestic and commercial purposes. However, if you are looking for use the lights in such a place where there is a risk of water, or need the ability to hose lights off then you need to choose LED Waterproof lights. These lights are perfect for domestic and commercial use. IP65 rating gives complete protection against foreign bodies and water jets. Water disposed of by a nozzle of 6.3mm will have no damaging effect on LED light. When you are purchasing an outdoor lighting fixture it should be IP65 rated. This includes things like LED flood lights or LED garden Lights. As you know see, the first digit in this IP rating is 6. It also gives a strong protection against the solid objects. It is not possible for any solid particle (dust, dirt etc) to affect the LED light. The second digit, 4, implies that the LED provides protection against splashing water only. By definition this is the highest rating of most LED corn Light Bulb can get. That is because the bulb will always have to screw into a base and that base cannot be sealed. But as most LED corn lights are used in the lighting fixtures,IP64 is enough. LED lights with IP54 provide a complete dust protection. However, for liquids, it gives a protection against splashing water only. This will be common in basic led light bulbs and indoor fixtures. IP40 LED lights are normally used in an enclosed fixtures or indoor. An IP40 LED light should never be outdoors unless the fixture is sealed. It is usually fine indoors unless it’s an area of high humidity or other harsh conditions. A lot of indoor LED Lights, LED retrofit kits and other fixtures fall in this category. AIS LED is a leading LED lighting supplier with innovative green technology. We are specialized in the manufacturing of innovative, next-generation LED lighting solutions such as E27/E40 LED corn bulb, LED street lights, PL G24 LED lights, PL G23 LED bulbs, portable LED work lights, LED Flood lights,R7S LED bulb, LED stadium lights and so on. AIS LED is committed to providing high-quality, sustainable, green lighting solutions to the world LED lights market.